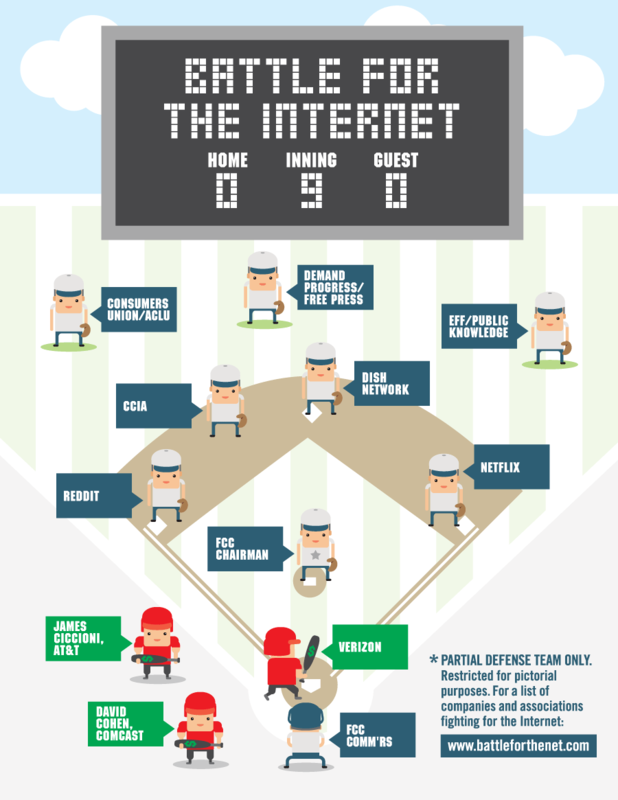 As the World Series begins, baseball analogies on a series of Washington decisions impacting Internet users come to mind. After millions of lobbying dollars spent by Internet Access Providers and an historic level of public comments at the FCC, key Washington battles for the Internet are headed for the final inning. The near monopolists are at bat and are swinging for the fences in a bid to kill open Internet rules and dominate the online ecosystem. I see FCC Chairman Wheeler on the mound, trying to decide what to pitch while millions of interested parties fill the stands. Other Commissioners and key players try to signal the pitch as they elbow each other to play coach or catcher. Filling out the defensive field are an array of stakeholders looking out for consumer interests, future competition and online innovation. The game is how to construct enforceable Open Internet rules, and prevent control of parts of the Internet by dominant abusive players. The batting lineup includes broadband Internet Access Providers seeking weak Internet access neutrality rules, Comcast seeking approval for its massive merger, and AT&T pushing for its different, but also huge merger. If they win this game, and they are swinging their lobbying bats hard to do so, they could escalate pricing at will for customers and other businesses, and impact the flow and freedom of content -- with little accountability or redress. 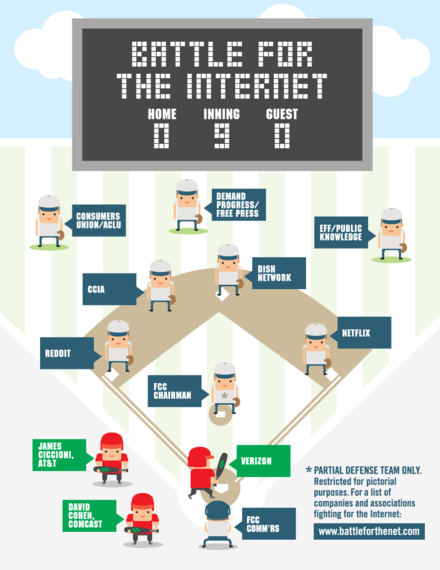 The outcome of this high stakes baseball game will impact the future of the Internet, and it depends on whether the FCC, which is charged with protecting consumers and the public interest, can get three strikeouts against powerful monopolistic anti-competitive interests. The general public sentiment, indicated by the majority of the 3.7 million FCC comments encouraging the Commission to establish Open Internet rules, fills the stands and helps in the outfield. While public interest groups, tech companies and associations make up part of the defense team, the White House recently signaled it was taking to the field as well, at least against the first batter, when President Obama weighed in recently with strong statements including "you don't want to start getting a differentiation in how accessible the Internet is to different users. You want to leave it open...". The debates on these issues suffer from a "who's on first" problem. A barrage of misleading claims by the dominant Internet Access Providers seek to confuse consumers and policy makers by attacking open access regulations as "regulation of the Internet." All the historic supporters of an open Internet recognize that limited and careful regulations are essential to preventing sweeping selfish regulation by these dominant players, and thus truly preserving the Internet's openness. All three strikeouts are needed to win: meaningful and strong open internet rules; blocking the Comcast merger; and stopping the AT&T/DirecTV merger. If those three strikeouts can be achieved it's a World Series level victory for consumers, small business entrepreneurs and for the public. All eyes are on the Chairman and the FCC wondering whether their pitching strategy can pull out a win. We hope FCC Chairman Wheeler will navigate this tough political game and pitch a win for consumers with a strategy that will hold up to the inevitable legal and political challenges from broadband Internet Access Providers crying foul and using their political contributions and friends to call for a replay.